118' Benetti Motor Yacht, Shalimar. Based in the Caribbean all summer. Shalimar is waiting to take you on a wonderful relaxing vacation where the waters are warm, food is fabulous and destinations are not as crowded. You can swim or soak up the sun on a deserted beach or lie in the shade all day. 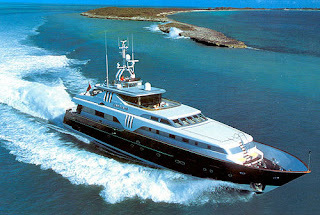 If interested in diving or fishing this is the perfect yacht. Shalimar is fully rigged for Diving or Deep Sea Fishing; she has a commercial dive compressor, 8 full sets of dive gear, and a Nitrox mixer. She also tows a 32' Century Center Console Tender, perfect for taking your clients out to a dive site or reeling in fresh fish for dinner.